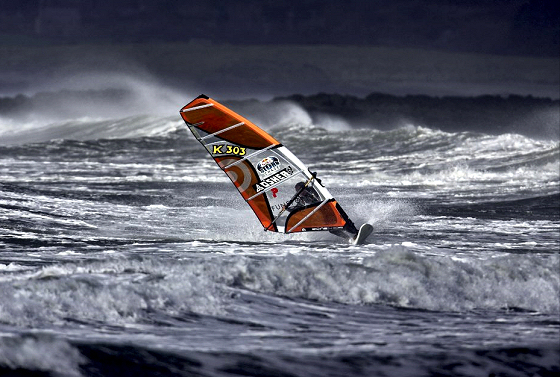 The bravest windsurfers on Earth will have the chance to keep spying a Red Bull Storm Chase opportunity, during 2013. Lopez, Boujmaa Guilloul, Philip Köster, Kai Lenny, Robby Swift, Julien Taboulet, and Thomas Traversa are ready to challenge the most harsh spots in the world. The goal is simple: hunt down three massive storms to find one storm windsurfing champion, after fierce duels of man versus man versus Nature. From the 10th January to the 22nd March, all sailors will be on standby for the first of two contest periods. Later, from the 22nd July on, it is time for the second competition window. and July until September. That”s why we decided to split the waiting period into two parts”, explains Klaas Voget, Red Bull Storm Chase sports director. “After a fourmonth break in spring we”ll continue the chase in mid-July to hunt down the final storm for the ultimate showdown”.